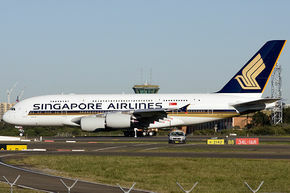 The A380 is a large widebodied airliner intended as a direct competitor to the Boeing 747. It is manufactured by Airbus. It is currently the largest passenger aircraft manufactured. It has two decks running the full length of the aircraft and four large turbofan engines. The aircraft also has an area in the nose that airlines can fit out as they wish. Options such as shops, childcare and gyms have been discussed, and the head of Virgin Airlines has declared that he would like to include casinos and private bedrooms with double beds. The A380 has been beset by technical problems during manufacturing, based in Toulouse, France. This has led to delivery delays which have caused some customers to cancel their orders in favor of the Boeing 747. ↑ Orders & deliveries | Airbus, Commercial Aircraft (en-US). ↑ The Sun Online "Biggest Plane Unveiled"
This page was last modified on 7 May 2017, at 15:50.